Sup everyone 👅 First of all I’d like to wish you a happy Easter, I hope you all have a great day! 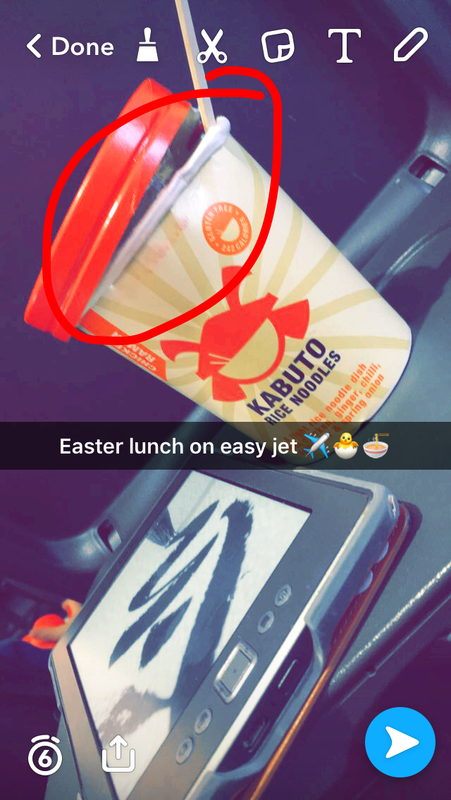 I am currently sat in an easy jet airbus and I’ve just finished my lunch, which is what I’m going to be telling you about. 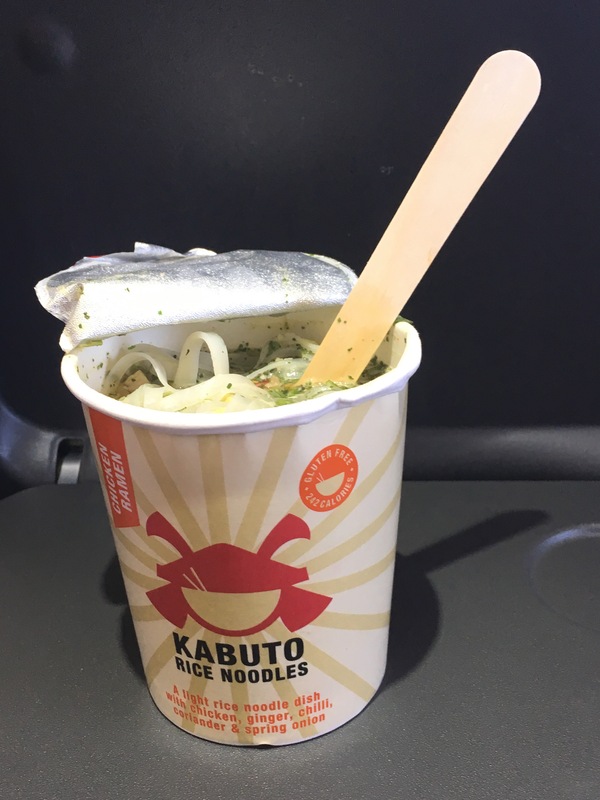 I just had the pleasure of savouring a Kabuto rice noodle pot. I usually order the Food Doctor couscous and lentil pot but I was quite disappointed when I heard that they’ve stopped doing it. So instead I asked what else they had and the lady told me about the noodles. I was hungry so I decided to give it a shot. It costs £3 or 4€ which is a fair price. It came with a cute wooden fork. You have to wait a few minutes for it to be ready. 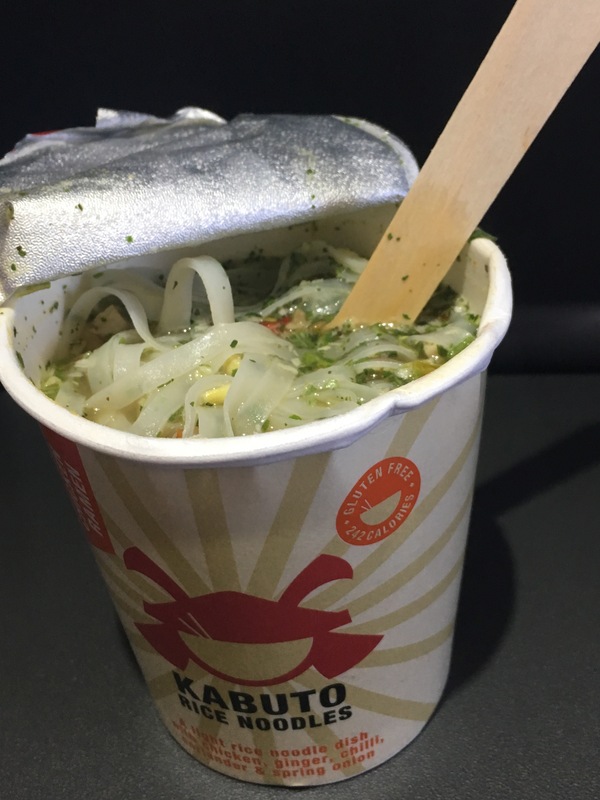 The flavours are great, and they linger in your mouth for a while which is nice. The coriander isn’t over powering and it’s chopped up fine which is perfect! It tastes so fresh and there was a great amount of noodles; not too many but not too few. 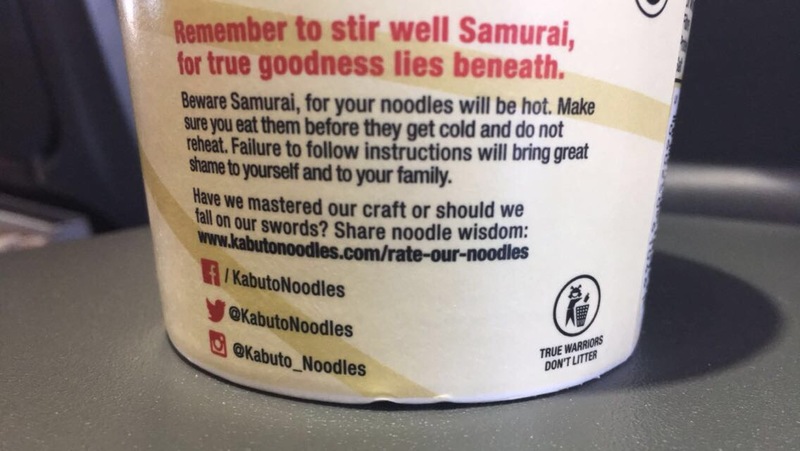 I drank the ~noodle water~ out of the cup and it wasn’t bland at all! It could of had a bit more of a kick to it but the chilli spicyness was fine. I’d rate it one chilli pepper out of three aka 🌶/🌶🌶🌶 in the spicyness scale. Maybe if it had a little (getting fancy here) sachet with some extra chilli in so you can customise your intensity. But that’s my only critique on this. The packaging is cute and the writing on the back made me laugh. 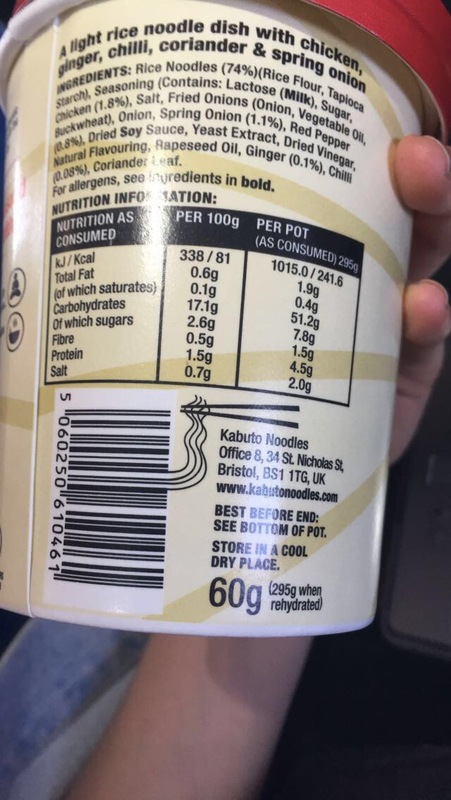 Also the bar code was like a chopstick and noodles which I thought was quite funny. 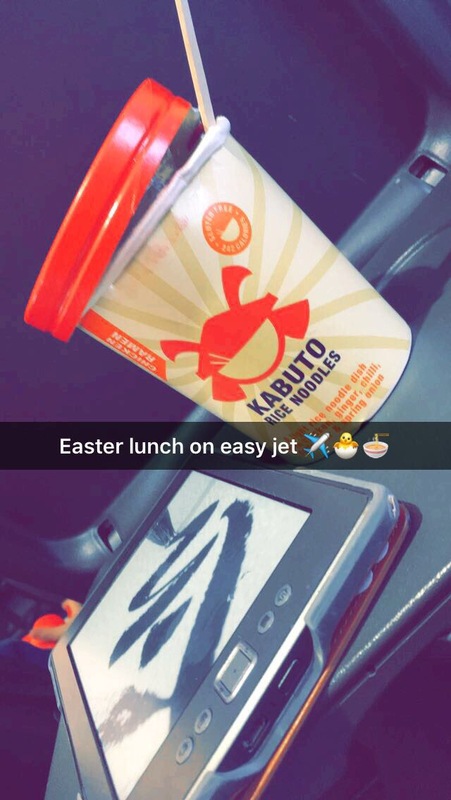 What’s great about this is that since you’d order this in a plane (maybe) and it’s partially soup, partially noodles. It keeps you nice and hydrated which I think is so important when you travel. And I often forget to drink 😦 Its nice and filling and there’s nothing bad with this pot. I really enjoyed it. Would I buy it again? Yes, it was exactly what i needed, even though I’ll miss my dear lentil pot. I’m glad it has a replacement that lives up to its standards. Is it better than the couscous and lentil pot? No, but it is as good. The bar was raised very hard with my old favourite but I can’t complain since this new addition is delicious. The only tragic thing about this is that it’s not vegetarian which means Evie (love ya) won’t be able to order it and I know that she loved the lentil pot too. 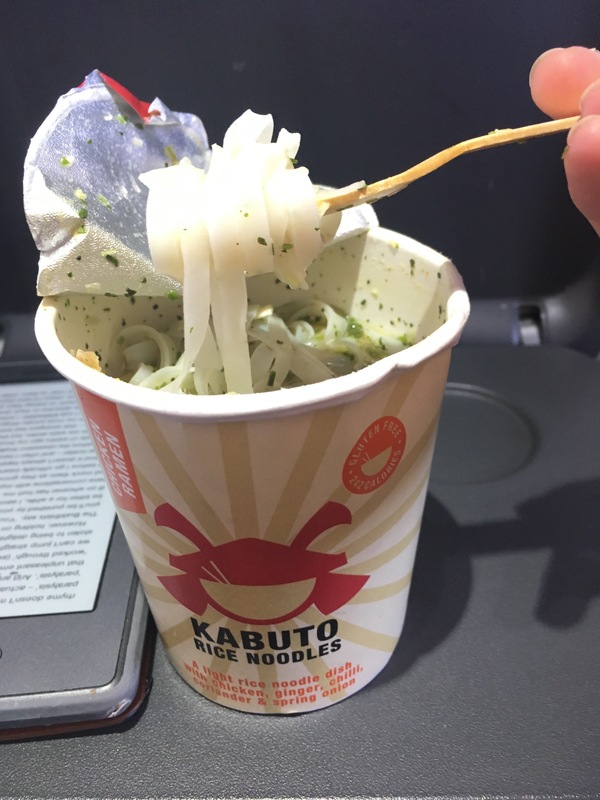 Overall I’m not too sad about the loss of my staple airplane snack. Ooooh, now that looks like a tasty snack, and only 242 calories…perfeck !! Light, Healthy and great for hydration, as you noted, ideal when flying.